Twenty Old Testament stories re-told by G.P. Taylorand Paula Parker in partnership with Walk Throughthe Bible Ministries. In a world where children are probably more familiar with Harry Potterthan Jesus, it's often hard to encourage them to read the Bible inits traditional form. YHWH introduces the wonderful Bible stories tothem in a way that captures their imagination. YHWH is based on the scripture but adds description and other allegoryto make the stories come alive. This project is supported byWalk Through the Bible Ministries who teach the Bible to over40,000 school children as a tool for evangelism and would be ideal asa gift for children and young people unfamiliar with the classic Biblenarratives. In a world where children are probably more familiar with Harry Potter than Jesus, it's often hard to encourage them to read the Bible in its traditional form. YHWH introduces the wonderful Bible stories to them in a way that captures their imagination. 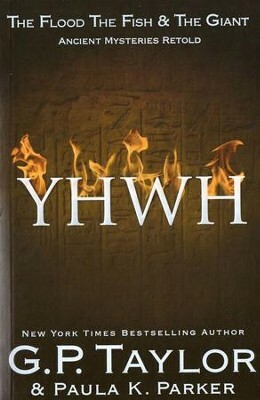 YHWH is based on Scripture but adds description and allegory to make the stories come alive. The project is supported by Walk Through the Bible Ministries who teach the Bible to over 40,000 school children each year. It makes an great evangelism tool and gift for young people unfamiliar with the classic Bible narratives. G. P. Taylor(www.shadowmancer.com) is the author of Tersias the Oracle, as well as New York Times bestsellers Shadowmancer and Wormwood. He has recently co-authored Rosie: note to self with Claire Connor. Paula K. Parker is a nationally recognized playwright, author, and freelance writer. She is highly respected in the Christian entertainment industry and is frequently called upon to write about it. She has contributed more than 1000 articles, personality profiles, and CD, book, and theatrical reviews to such national publications as Christian Single Magazine, Profile Magazine, ParentLife Magazine, and Clarity Magazine.When she is not writing, Paula whiles away the hours with her writer/actor husband Mike, visiting with their five grown children, playing in their gardens, restoring their vintage home, cooking, baking (especially anything chocolatey) and playing the harp. I'm the author/artist and I want to review YHWH (Yahweh): Ancient Stories Retold: The Flood, The Fish & The Giant - eBook.